The network will provide access to rapid charging for commercial EV users. The companies’ respective networks, GeniePoint and Source London, will also offer full inter-operability to their respective members. ChargePoint Services aims to have around 30 new Rapid Chargers on line by summer 2017. Source London has been owned by Bluepoint London, which is part of the Bollore Group, since 2014. Christophe Arnaud, managing director of BluepointLondon, said: “We are continuously looking at ways to improve Source London for the benefit of our growing community of members and we are very proud to announce our collaboration with ChargePoint Services. 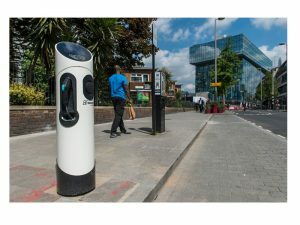 The UK’s rapid charging network has traditionally focused on en-route stops (service stations), as there is a perceived notion that cars in London are typically parked for hours and therefore do not need access to rapid charging units. The realisation recently, however, is that that are a number of commercial operators that could benefit from a rapid charging network, and that more and more taxis will soon be running on electricity and will require short stops in London to double-shift. The new network will allow commercial EV operators to recharge in 20-40 minutes depending on vehicle type, helping to keep vehicles moving throughout the working day and night.